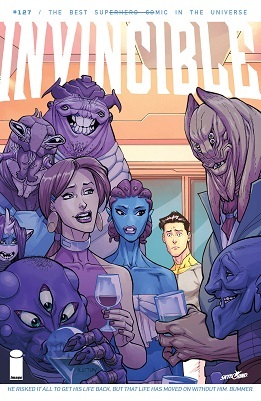 One scene from Invincible #78 that should cheer the community. And no, just because it's Invincible, it doesn't mean that somebody is being eviscerated, so this is gore-free. Just remember that Mark has been off Earth for ten months. 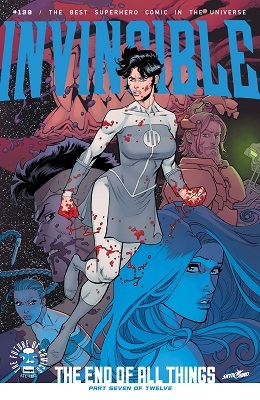 Samantha Eve Wilkins AKA Atom Eve's the core female character in Robert Kirkman's Invincible series. 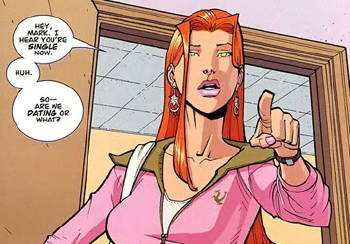 When she was introduced, it was as a teen superhero from the same mold as Mark, who happened to be attending the same school as him. They soon became close and the pair have acted as support for one another since, with a will-they/won't-they chemistry being part of their ongoing relationship. Eve was genetically engineered to be a living weapon, but was unaware of this fact and developed a refreshingly practical outlook on superheroics and the best uses of her powers. Oh, and her love life. 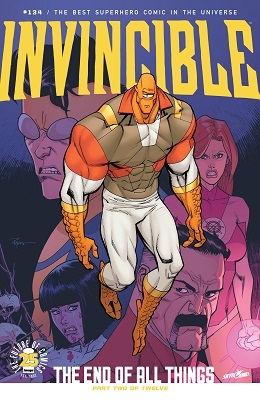 4 pages from Invincible #20 and 2 from Invincible #32 beneath the cut.